The name Michael Myers is synonymous with Halloween. 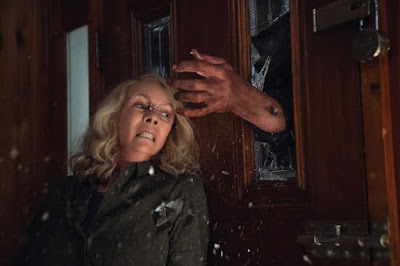 Forty years after the events of 1978’s Halloween, Laurie Strode (Curtis) now lives in a heavily guarded home on the edge of Haddonfield, where she’s spent decades preparing for Michael’s potential return. 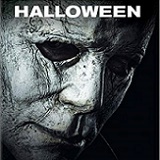 After being locked up in an institution, Myers manages to escape when a bus transfer goes terribly wrong, leading to chaos in the same town he preyed on decades earlier. Laurie now faces a terrifying showdown when the deranged killer returns for her and her family – but this time, she’s ready for him. Laurie Strode (Jamie Lee Curtis) lives in hiding. Her serial killer brother, Michael, is institutionalized. Knowing that has given her little solace. Laurie knows Michael will come for her one day and she plans to be prepared. She has taken herself off the grid. Her preparations and anxieties cost her more than one marriage and a child. Her daughter Karen (Judy Greer) was removed from her care as a teenager. Karen is now grown up and has a daughter of her own. She does not have a healthy relationship with her mother. 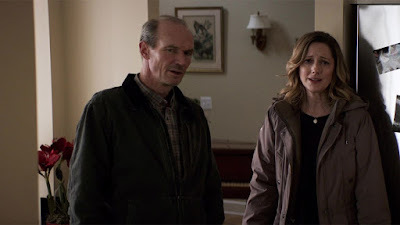 Karen’s daughter Allyson (Andi Matichak) is closer to her grandmother. She is aware of the serial killer in the family but wants her grandmother to let it go and get closer to her and her mom. 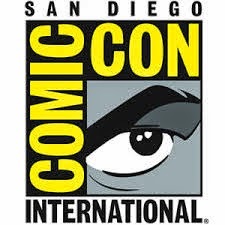 True crime podcasters Aaron and Dana have tracked down Laurie for an interview. They are interested in Michael’s case as he is being transferred to a new facility. They meet with Michael and are informed that although he can, he does not speak. He clearly has a significant effect on the fellow facility residents. Honoring the bad decisions required for all horror movie plots, Michael is moved by bus on the eve of Halloween. Soon Michael is on the loose and everyone is in danger. Laurie has become some what agoraphobic but when she learns of Michael’s escape, she plans to end the terror once and for all. This is your typical slasher flick. People die in ugly ways and in typical Michael style some people are randomly spared. Michael is not immortal but seems darn near close to it, as he is immune to run of the mill life threatening injuries. Part of the fun of films like this is the campy horror standards that come in to play. My advice: 1) don’t transfer the serial killer 2) don’t put him on a minimally secure bus 3) when he does get loose call in the cavalry. It’s always a local small-town sheriff who is overwhelmed and under-prepared for the manhunt. 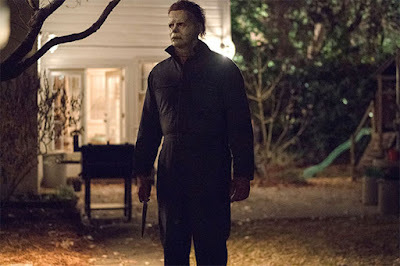 Haddonfield, Illinois, where the initial babysitter murders took place becomes Michael’s buffet of death as he walks past trick or treaters and into some unlucky resident’s homes. Halloween is an updated take on the old ideas. Michael is an unstoppable killer who doesn’t play well with family. I can’t pinpoint why I enjoyed this film much more than I expected to. It has re-watchability, which some of the older dated films don’t for me. I’ll watch the full marathon at Halloween, but I’d watch this film all year long. Even though the events are extremely predictable, it’s still creepy. There is a touch of humor, as well. Fans of the series should enjoy the film. The story flashes back to enough of the past to make sure any newcomer understands Michael’s gruesome history. It’s bloody but never disgusting to watch (for those that aren’t squeamish about such things already). I enjoyed it in the theater and again at home twice. Horror movies are something I like to repeat, and this doesn’t lose its luster once you know how it ends. 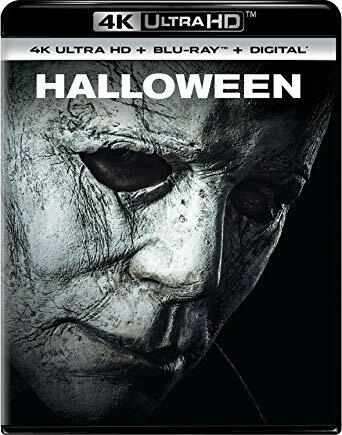 Halloween was shot digitally and upscaled to 4K. I was surprised to see a 4K release because these are the types of movies that you expect to be shot on film to have an intentional grainy quality. The upgrade from Blu-ray to UHD is evident, but not a spectacular leap. The Blu-ray was already a nice-looking picture. Fine details in faces and objects show better on UHD. The colors show a marked improvement in both range and depth. I found myself noticing items at the mental hospital and feeling like I was getting more texture and detail in that location. When Michael stalks his victims in the dark, or in their dimly lit homes, black levels are excellent, and the action is never masked by the darkness. 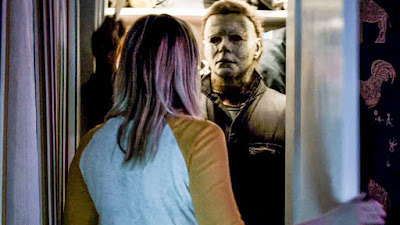 Halloween's DTS:X doesn’t seem to make use of all channels but does hold up well overall. The soundtrack is important, and the theme music comes through with clarity. The subwoofer is put to use, without being overwhelming. Gunshots ring slightly less than true but when a car runs over a man you hear him crunch. Similarly stabbing sound effects and other dying sounds come through loud and clear. Dialogue is intelligible, and the screaming isn’t too much. Deleted/Extended Scenes (12:35 total runtime): Extended Shooting Range, Suicide Thoughts, Shower Mask Visit, Jog to a Hanging Dog, Allyson and Friends at School, Cameron and Cops Don't Mix, Deluxe Banh Mi Cops, and Sartain and Hawkins Ride Along. Back in Haddonfield: Making Halloween (6:05): A making of featurette which looks at this film as a stand-alone but also paying homage to the original. This featurette looks at characters, death scenes and more. The Original Scream Queen (2:32): Jamie Lee Curtis is the scream queen and here cast and crew compliment her contributions. The Sound of Fear (3:19): A look at how this score came to be with the basis of Carpenter’s original music. Journey of the Mask (2:33): Creation of the iconic Halloween mask with discussion about its history and effects. 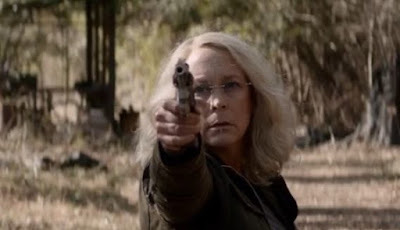 The Legacy of Halloween (4:24): Jamie Lee Curtis, John Carpenter, Director David Gordon Green, and Jason Blum talk about making Halloween, why it’s been successful over the years, and Laurie Strode and Michael as the central characters. I always recommend watching a series in order. Now that this film is available to own, you have the time to go back and see where Michael Myers has been. If you must skip that step, you won’t be lost with Halloween. You won’t fully understand all the references to Michael’s past and Dr. Loomis, but you can quickly surmise that this silent killer won’t go down easily. Watching this film in the theater, in October, with a packed audience was great. Re-watching at home, after knowing who lives or dies, is still just as enjoyable. This is the first time I wished that they’d stuck to film and offered less sharpness and clarity but overall, I have no complaints. The Blu-ray looks good and the 4K UHD looks a tick better. The extras are brief and enjoyable, and this is definitely one for every horror fan to own. Recommended.